Is that it relies upon an efficient transmission of air through the fin coils to allow the fans to work at maximum efficiency with the lowest energy input. A client datacentre run by the Norland Managed Services Enterprise Infrastructure team had four new DVES1.4-284CA-E91.M3.740 Dry Air Coolers fitted. Manufactured and installed by Coolers & Condensers Limited, Fareham it soon became evident that the local conditions were going to cause a problem. Less than one mile from the datacentre is a recycling plant, a landfill site and large stretches of woodland and open grassland. The result can be seen in the picture which was taken BEFORE the units were fully operational. Depending upon the season these cooling coils will become clogged with seed, pollen, dust, leaves and insects which reduces efficiency and increases energy consumption. The consultant contacted Richard Betts of RAB Specialist Engineers Limited to submit a proposal for the external filter protection of the coils and additional curtains to alleviate the wind chill factor in the winter months. 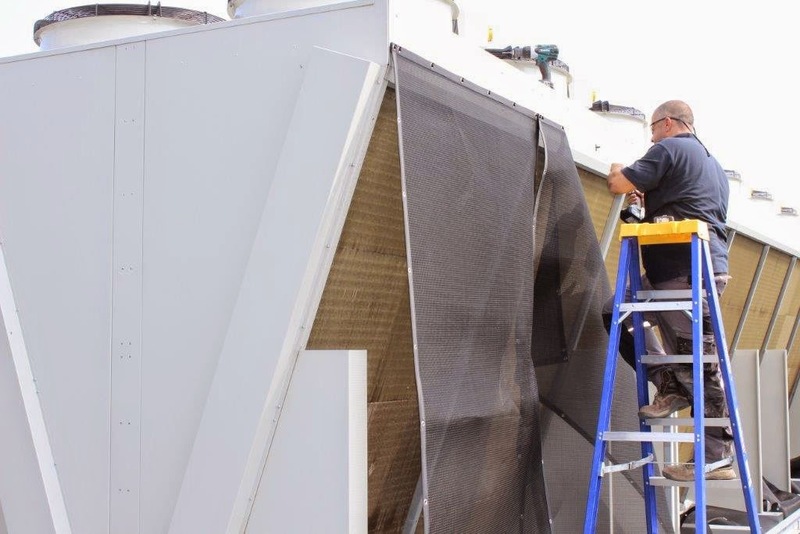 RAB Specialist Engineers were able to offer a variety of solutions using the flexibility of the Permatron factory in Chicago and their own experience of air intake filter design. The winning bid used Permatron PreVent® BHC filters mounted on nylon drop tab fastenings secured to the cooler framework with stainless steel fixings. To create the winter curtain, vinyl sheeting was machined and fitted with stainless steel grommets to match each filter. The first job was to clean the coil fins using refrigeration specialist JSA Services who attended site alongside the RAB engineers. Following consultation with the manufacturers it was decided to use a water wash down only as we wanted to fully protect the poly/ali fins from any possible chemical damage. A pressure washer was used to gently remove the grime. RAB engineers then used battery operated drills and screwdrivers to fit the nylon fasteners and hang the air intake screens.